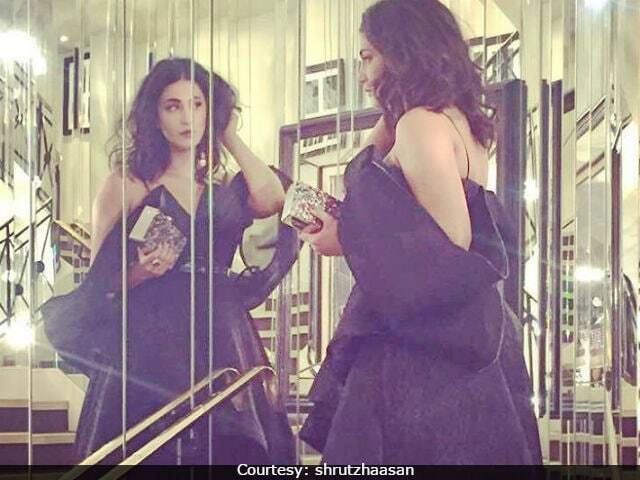 Cannes Film Festival: Shruti Haasan's Red Carpet Debut - Like Her Look? After actresses Deepika Padukone, Mallika Sherawat and Nandita Das, Shruti Haasan made an appearance at Cannes Film Festival 2017. She wore a black Avaro Figlio dress paired with silver stilettos. This was her maiden appearance at Cannes. She was accompanied by music composer A R Rahman. Both the artistes were representing their upcoming film Sanghamithra at Cannes. On Thursday night, the first look poster of the film was launched at Cannes. "The atmosphere is lovely and there's so much of excitement around that you get sucked in. It feels special to be in this place at the beginning of my career," Shruti earlier told news agency IANS. Check out her look at Cannes. Did you like Shruti Haasan's debut appearance? In Sanghamithra, Shruti Haasan plays a warrior princess. The historic drama is directed by Sundar C and produced by Sri Thenandal Films. Sanghamithra will be released in Tamil, Telugu and Hindi. Shruti Haasan co-stars with Arya and Jayam Ravi in the film. Meanwhile, Deepika Padukone concluded her Cannes trip with a bang in a Brandon Maxwell gown on May 18. This was Deepika's first appearance as a L'Oreal face and now, Aishwarya Rai Bachchan is all set to take over. She will walk the red carpet today and tomorrow. Aishwarya will also represent her 2002 film Devdas yet again. Here's Aishwarya Rai's first look at Cannes during a media interaction. After Aishwarya, Sonam Kapoor will walk the Cannes red carpet. Here's Mallika Sherawat in a white Georges Hobeika couture. Cannes Film Festival began on May 17 and will end on May 28.